You know what? I agree with him. I think it takes some serious nerve to put yourself on a list like that, but his rationale works for me. I'm not sure if the list is in significance order -- if it is, I'd move Herb up a notch or two -- but these are the folks. And four of them were on the speakers list for C++ connections last year. I was honoured, truly, to be on that list with them and need no more than that. Managed code programming models and frameworks offer developers a great boost in productivity and code maintainability. This session demonstrates the use of the C++/Common Language Infrastructure (CLI) language binding to access .NET platform features. Rather than re-write applications from scratch to take advantage of managed code, Visual C++ gives developers the ability to enjoy the advantages of managed code whilst still leveraging their existing native code base. This is the power of C++/CLI - don't port or rewrite, integrate! You're going to love it. I'm thrilled to confirm that I will be speaking at Tech Ed in Sun City again this year! I'm travelling on South African Airways this time (it's been Lufthansa before) and taking a different route, so there will be some novelty along with the familiarity. I just love the energy at this conference; I can't wait to get there! The code camp concept keeps spreading. October 14th will see Code Camp Montreal: it's free, it's bilingual, it's in downtown Montreal. All you need to do is register! Attending will be a great way to meet other developers and to learn as much as you can cram into your brain in a single Saturday. I wish I could be there, I know it will be great. Sasha Krsmanovic has been working for Microsoft for a very long time, but as a v-, a vendor. This summer they finally made it official and hired him as a regular employee. At the same time he moved roles, so now instead of looking after me as an RD and a user group leader, he's looking after me as an MVP. Works for me! 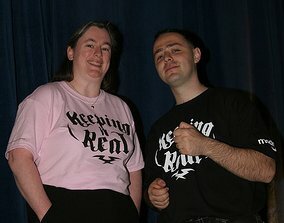 This is me with Sasha back at realDevelopment06. One more update about my Dad and then some catching up from the old "stuff to blog" file. My Dad has an inoperable lump. Visually the surgeon says it is cancer, but two biopsies have been negative. This lump was blocking bile ducts, blocking the bowel, and doing various things that cause terrible pain and can kill you within days. His late August surgery moved things out of the way of the lump, leaving him to recover from the surgery (and subsequent abscess) and the weight loss and muscle loss that comes from going over 6 weeks without really eating. He has done an amazing job of that, returning within days to regular bike riding, sailing the 26 foot wooden boat he took around the world, and putting weight back on. He is also figuring out how to balance his pain meds so that he can stay as active as he wants to be. How long does he have? We don't know. He could have died back in August in that dingy hospital room, wearing just that stupid backless gown and with no comforts of home. Now he is home, with ocean views from every room, his own clothes, his own shower, his bike, his boat, music, his laptop, and family. I hope he has another year or more... but we are all prepared for less. And we are all living as though he has more, much more. I have reached Halifax and seen my dad. He's thin but still Dad. Tomorrow he will be going home because at the moment he doesn't particularly need to be in the hospital. We will take it one day at a time. Also, I found an online story about our neighbours' fire. It's kind of inaccurate because the number of people is wrong (the front tenant wasn't just one person living alone I don't think) and it leaves out my friends' dog and hamster both (the hamster was apparently mentioned in the TV report) but it has some details for those who are interested: http://www.mykawartha.com/article/3964. An earlier draft at http://www.mykawartha.com/ka/article/3930 has less details but I'll include the link for completeness. You might want to poke around mykawartha.com to see how exciting my life normally gets: a parking lot near our Peterborough office is to be shut down for a while, City of Kawartha Lakes council is trying to fund the renovations needed at the Janetville community centre (where my boy takes martial arts lessons), and somebody (other than me) wrote a book. My mother is still in Winnipeg so we don't know what was decomposing in one of those row houses yet.